I just noticed that the filling recipe I had here needed to be doubled so if it looks slightly different then how you remembered it, that's because it is! Sorry!! In a bowl mix 3 cups of cold whole milk with 2 packages of FRENCH vanilla pudding. Beat for 2 minutes. In another bowl(preferably chilled) or using your stand mixer, beat your heavy whipping cream until soft peaks. Add in your powdered sugar and vanilla extract and continue to beat until stiff peaks form. Fold your french vanilla pudding in with your whipping cream and refrigerate for later use. It's best to make your filling the night before. Measure out your 1 cup of flour and set aside. Place cubed shortening ,salt, sugar, and water in pot and bring to a quick rolling boil. Dump in your flour ALL AT ONCE. Turn off heat and continue to stir until dough starts to form a ball. Remove from heat and allow to cool slightly before next step. Beat in your eggs one at a time, making sure each one is nicely incorporated before adding in the next. Once all of your eggs are in the dough, continue to beat the dough for a good couple of minutes. When you lift the beater, the dough should stream down nicely(but not too fast) into your bowl, leaving a so called "V" shape at the end of the beater. Place a piece of parchment paper on a large baking sheet. Place a small amount of dough on all four corners of the parchment paper to keep it from sliding around. Place your dough in a disposable pastry bad fitted with Wilton's #12 tip. Pipe your shells using a circular motion, giving them height as you swirl up. Space your shells at least 1 inch apart from each other. Bake in your preheated 425 degree oven for 14-15 minutes and then... DROP THE TEMP DOWN TO 350 DEGREES for another 14-15 minutes!! DO NOT OPEN YOUR OVEN DOORS FOR ANY REASON!!! Once shells are done, remove from cookie sheet and allow to cool before filling. Total baking time: 28-30 minutes. 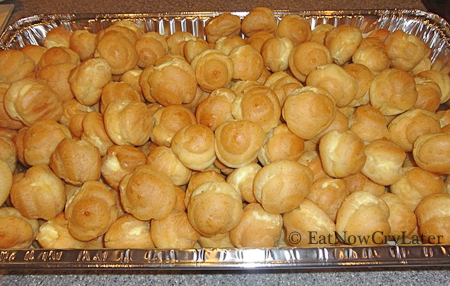 Please visit my new channel on youtube to learn how I make these delicious mini cream puffs!! Well done. This was my first attempt at making cream puffs and I decided to make them adding to my christmas cookie gifts. They came out perfect and delicious. Recipe is very easy to follow! Thank You!! All Natural Dijon Mustard can actually have a profound effect on metabolism, even at rest, as well as improving overall digestion and nutrient utiliization. Apple Cider Vinegar aids in weightloss by detoxifying the liver, increasing metabolism, and supressing hunger levels! White and Red Wine Vinegar have been shown to improve blood sugar levels, reduce insulin, and slow digestion. And if that wasn't enough, other herbs and spices such as ginger, garlic, lemon, cayenne, basil, parsley, and thyme have all been shown to have significant metabolism-boosting properties as they stimulate your taste buds to boot! Fact is, when you learn how to cook with the right ingredients, you can really begin to enjoy both the fat-burning properties and the ultimate flavor of the foods you use to slim your waist. And that's exactly what Dave and Karine have put together in the Metabolic Cooking series -- more than 250 mouth-watering, fat-annihilating recipes for you to choose from. And of course, they also have many fat burning salad dressing recipe! Check it out here: 250+ Mouth-watering Metabolic Cooking Recipes <------- Quick & Easy! will it get soggy if i left it in the fridge over night? It will be soft...not as much soggy. I would still recommend baking the shells and making the filling ahead of time, then on day of, fill them and serve immediately. if i use french vanilla jello brand pudding, is it 2 BIG boxes or 2 SMALL boxes? can i use a le creuset dutch oven or it has to be a steel pot for the shells? Yes, you may use that as well! Can i replace the shortening with butter? Do i have to use whole milk? No, you don't have to. But the consistency will be slightly thicker when using whole milk. Thank you very very very much for the recipe and the video. There is a pho place (Pho Than Brothers) on Broadway on Capitol Hill (Seattle) where they sell these by the dozen, and man, do i love them!!! This sounds like your oven wasn't hot enough when you put them in. Intense heat should make them puff (as the air inside expands) and form a crust quickly. Make sure your oven is at 425-450 when you start. You must use a thermometer to be sure. Ovens can lose their calibration. Try putting the puffs a bitter higher in the over (away from the heat) and double the tray you are cooking on. I.e., put one baking sheet on top of another. I loved making these a while back. Thank you for sharing your recipe with the world. But would you know how the recipe would look like if I were to cut the amount of cream puffs I wanted to make into half of original recipe?